If Bitcoin is dead or not, that’s subject to interpretation. Of course, it also depends on if you are a supporter or not. In my opinion, if BTC depreciation continues, other (most) altcoins might follow suit. Besides Tron which is charting new heights and aiming for a spot in the top 10-its down 20% in the last 24 Hrs, others like LTC continue to face the sword. 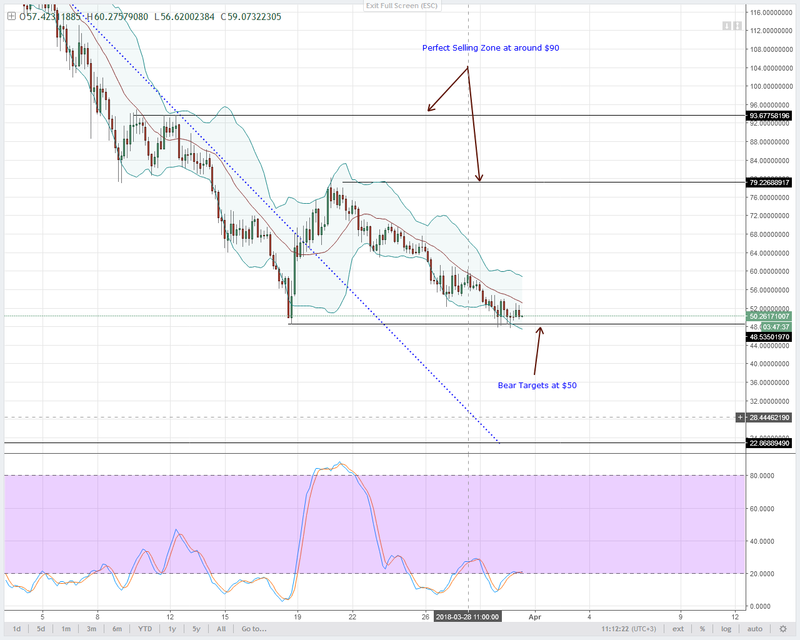 From our altcoins technical analysis, we might expect to see some slight recovery and thereafter, prices might continue dropping to new lows. After periods, weeks of Stellar Lumens depreciation, there’s a mild recovery. 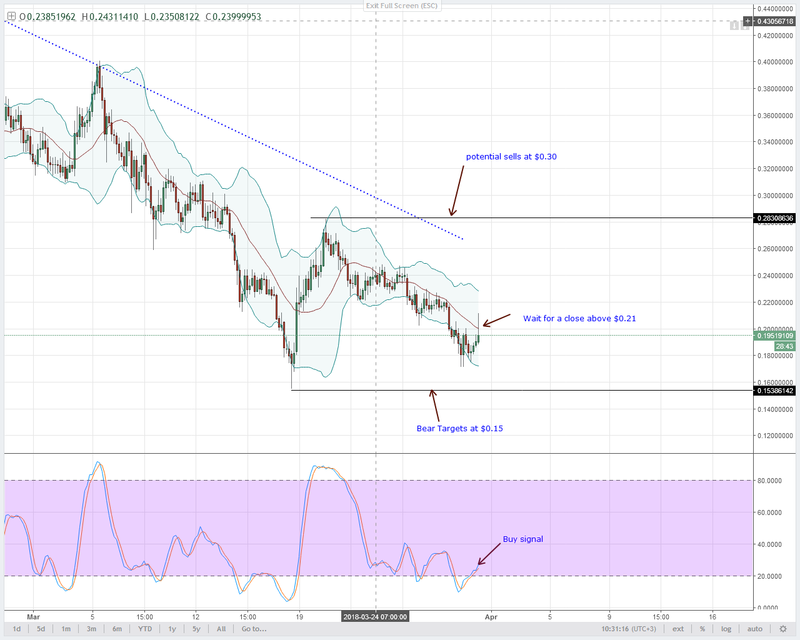 On our previous preview, we expected Stellar Lumens prices to recover now that we could see a stochastic buy signal in place and most importantly, a bullish divergence pattern. Notice how prices were trickling down as buy pressure picked up. At the moment, I expect higher highs. This is us fading the general bear move but our earlier plan was to short whenever a stochastic sell signal forms. We can either wait for that to happen or buy short-term with stops below yesterday’s lows at $0.17. Only buy when prices are above $0.21 or the 4HR chart middle BB. 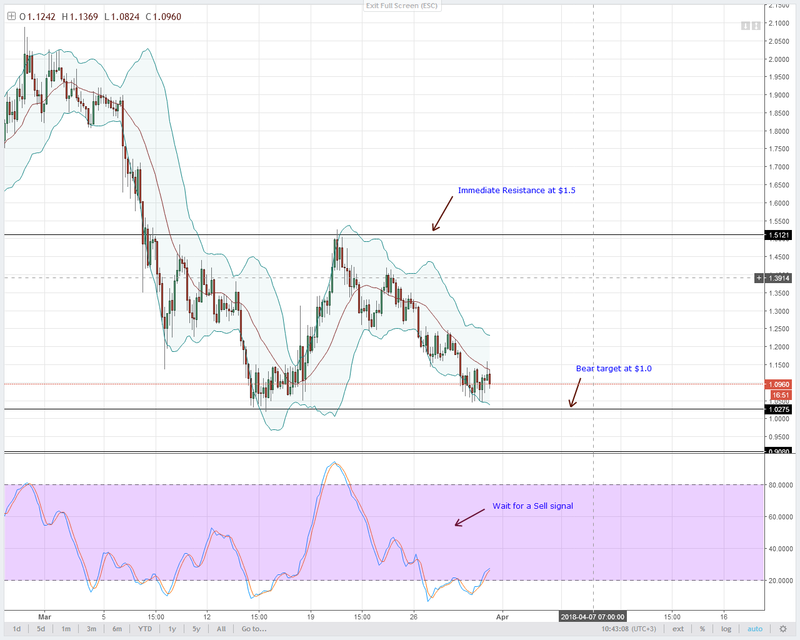 According to data, IOTA is down 2.22% but unfortunately, bears are yet to cash their profits at $1. As it is, the 20 period MA is our immediate resistance line and we can see how sellers have been jumping in whenever buyers test this level. Our trade plan remains the same and unless there are strong supportive fundamentals, IOTA sellers should hold on tight and aim for $1. On the flip side, if buyers pick up and push prices above $1.2, then sellers should exit their shorts and aggressive buyers can with immediate targets at $1.5. In that case, stops should be at $1. From the chart, it’s obvious that we cannot see major gains. That has been the case in the last 48HRs or so and even though buyers look the part, our bearish skew remains steadfast. That’s unless of course there are strong reasons to load this token which has no working product and a large fan base. 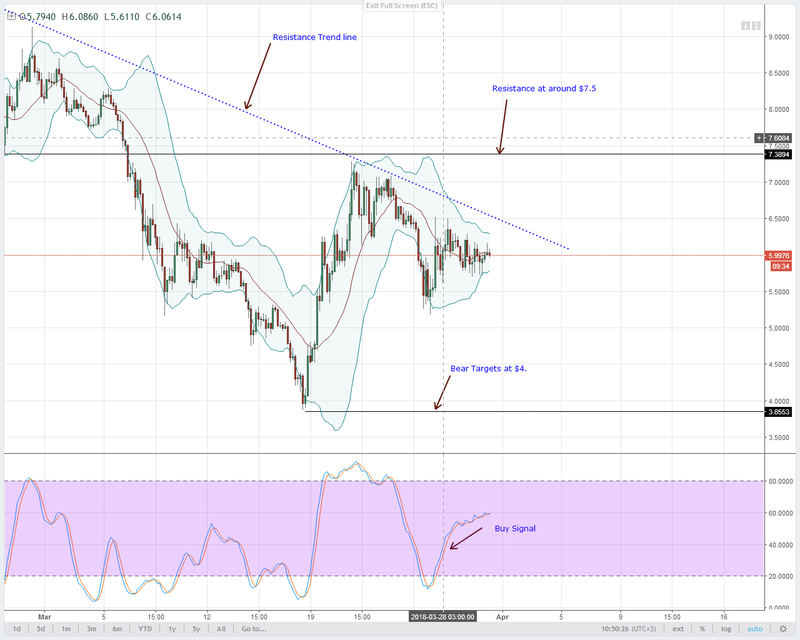 I’m a seller and as such, EOS traders can wait for sell opportunities whenever a stochastic sell prints at or around $7.5. Alternatively, waiting for a drop below $5.5 means EOS would be trading below a 48HR support line and presents another selling opportunity. The depreciation has been devastating for LTC holders and unfortunately, the projection looks bad. Despite Abra’s integration, there is a gloom LTC projection more so when we take a top down approach. To begin with, this week’s bearish engulfing pattern and a follow through of a bearish break out, is indicative of potential release of sellers. It’s even worse in the monthly chart where it looks like the party just begun. 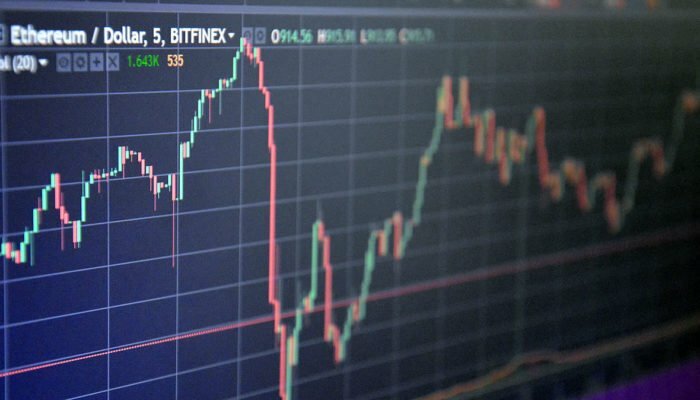 From price action and patterns, we shall place our upper limit at $135 and that’s where sellers should get in say there is a pump before a drop towards $100 in the coming session. 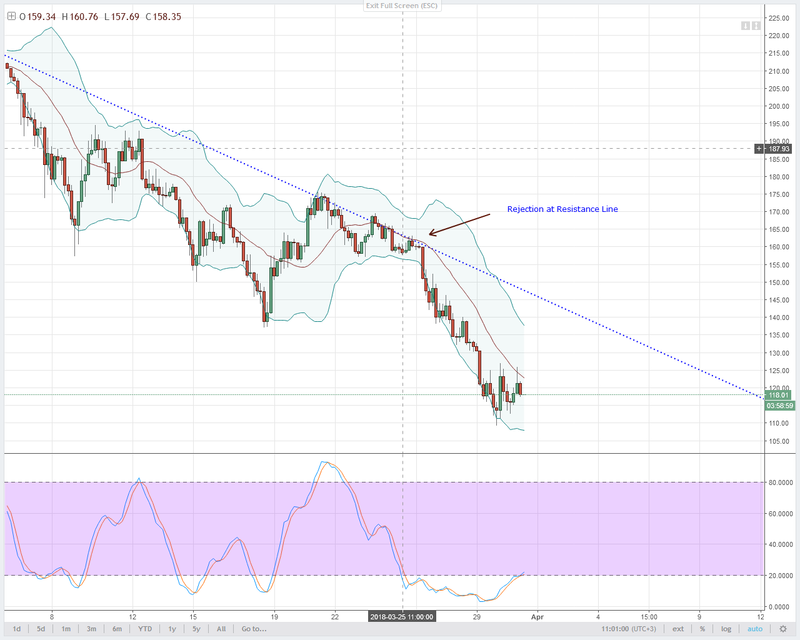 The depreciation continues and it seems like NEO bears are driving prices down in a straight line anyways, at least that what we can glean from the chart. Anyway, $50 remains important. Notwithstanding, if there’s a convincing breach, then NEO sellers can quickly print $40-at the 78.6% Fibonacci retracement and $25, a strong support line in 2017 in the coming weeks.